Combine everything you like into one chicken-green bean casserole: tender chicken, fresh green beans and creamy mushrooms. You'll love the convenience of this Make-Ahead Chicken-Green Bean Casserole. Meanwhile, melt butter in large nonstick skillet on medium heat. Add chicken; sprinkle with pepper. Cook 5 min. on each side or until chicken is done (165ºF); transfer to 13x9-inch baking dish sprayed with cooking spray. Cook and stir beans, mushrooms and onions in same skillet 6 to 8 min. or until beans and onions are crisp-tender. Sprinkle with flour; cook and stir 1 min. Stir in broth; simmer 3 min. or until thickened, stirring frequently. Add cream cheese; cook and stir 2 to 3 min. or until melted. Spoon over chicken; top with stuffing. Refrigerate up to 24 hours. Heat oven to 400ºF. Bake casserole (uncovered) 30 min. or until heated through. If serving dish on a buffet table, cook chicken as directed; cut into bite-size pieces. Stir into prepared vegetable mixture in 13x9-inch baking dish. Top with prepared stuffing. Bake as directed. 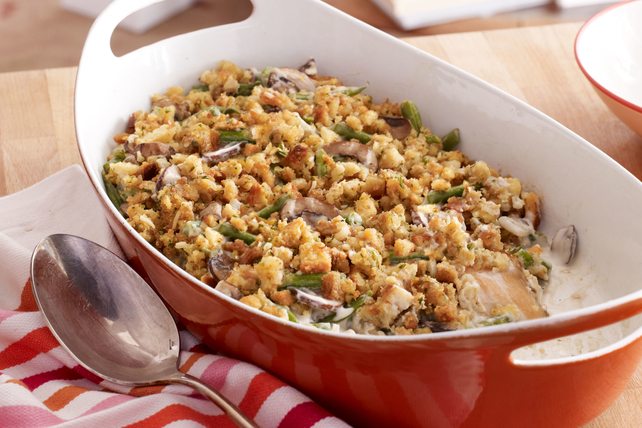 This delicious casserole can be refrigerated up to 24 hours before baking as directed.